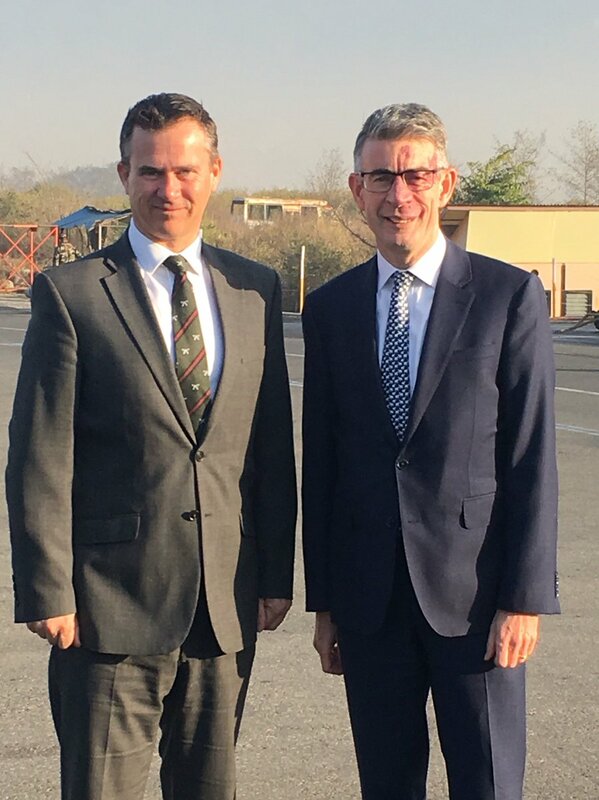 The Right Honourable Mark Lancaster TD MP visited Nepal last week, his first official visit as Minister for the Armed Forces in a trip to celebrate the historic ties between the UK and Nepal. Though this was the Minister’s first visit to Nepal, he has a long association with the Gurkhas having served with the Queen’s Gurkha Engineers as an officer in Hong Kong in the early 1980s. On arrival the Minister travelled to Pokhara to take part in this year’s Attestation Parade where, alongside the Inspecting Officer, General Sir Nick Carter, he inspected the 270 new recruits as they began their journey as soldiers in the British Army. Following the Parade and a delicious bhat he received a brief from the Gurkha Welfare Scheme on their work in Nepal, before traveling to Khaski to see the Residential Home and meet some of the residents. Then in the evening he was Senior Guest at a Sounding Retreat on the Parade Square in Pokhara where the Band of the Brigade of Gurkhas delighted all present with a wonderful display as the sun set over the Himalayas. Upon his return to Kathmandu the Minister took part in a series of visits and high level political meetings. This included a meeting with the President, Mrs Bidhya Devi Bhandari at which he was able to present to her the annual Brigade of Gurkhas Report on behalf of Lieutenant General Nick Pope, the Colonel Commandant of the Brigade. The report showed the excellent performance of the Nepalese citizens employed in the Brigade of Gurkhas in 2017 as they worked to fill a broad range of capabilities across the British Army. The Minister made visits to the Red Cross Blood Bank in Lalitpur, and the Humanitarian Staging Area at Kathmandu Airport before a working lunch focusing on Disaster Preparedness Co-operation. In the afternoon the Minister met with both the Defence Minister and Chief of Army Staff Nepal. On his final day the Minister called on both the Prime Minister and Leader of the Opposition (now PM) K.M. 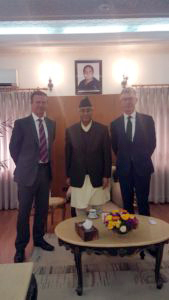 Oli before a lunch meeting with representatives from the Regimental Associations of Nepal. In the evening he was honoured to be the Chief Guest at Nepal’s Army Day Parade, a wonderful and varied display by the Nepalese Army – which also included a performance by the Brigade of Gurkhas Band.